Artists have responded to the Fort McMurray wildfire in many different ways. Many created new work to raise awareness, communicate empathy, or to raise funds. Forty seven poets from across Canada, including three from Fort McMurray, have contributed to "Fire and Sky", an anthology of poetry raising funds for the Wood Buffalo Regional Library. Several poems relate to the fire and its aftermath along with themese of loss, recovery, renewal, hope, adversity and triumph. David C. Brydges is the PoetsCare coordinator, helping to organize the first official book launch for "Fire and Sky" at the Wood Buffalo Regional Library on Tuesday, November 1st from 7 to 8:30 pm. Coincidentally, he is also an oil sands worker. I was intrigued and sent him a couple of questions. Oil sands worker AND poet. These are two things that don’t naturally connect. Well, I have always been a poet, curious human, and observer of life. Grew up in a silver mining town in Northern Ontario and my father was a hard rock miner and union member. My brother and I have both worked in the mines and the oil sands, which is open pit mining, is an extension of this albeit working more in the processing side. Am in the Construction and General Workers Union Local 92 and come out to do shutdown maintenance work. Have been highly privileged to be an inside witness to this industry that has gained its share of extremists which I reject. As a realist/ idealist I understand the need for this resource and yet know we are transitioning to a post oil carbon free energy society. How did poetry become part of your life? How does it continue to manifest in your life today? Ten years ago, was living in Edmonton and started to feel the urge to take my poetry more seriously than an intellectual hobby. Went and signed up at the Stroll of Poets reading series open mic and was warmly welcomed by fellow poets who at the time were total strangers. Have cultivated and nurtured several sustaining friendships and eventually joined the Stroll of Poets. While in Edmonton I volunteered and read at the Edmonton Poetry Festival. 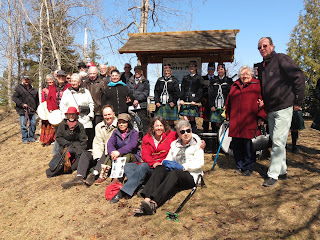 Then when I was back in my home town of Cobalt I decided in 2007 to start Northern Ontario’s first poetry festival. I was appointed the north's first poet laureate too. Have purchased a quarter of an acre for a poetry park also am involved in several innovative poetry projects that are cross disciplined. Spring Pulse Poet4ry Festival is celebrating its 10th anniversary next year. Joining poetry groups has allowed me to be more of a cultural entrepreneur and event planner. My passion is bringing people together through creating community by making history with unique event experiences. Organizing the anthology has quickened my interest in starting a publishing company (Bydge Builder Press) and adding an altruistic wing to it called PoetsCare. Its motto is inspiring write action and wants to give resources, tools, inspirational models to other poets who want to take a poem and create a movement connecting it to a worthy cause. The Fire and Sky anthology was this first official project and I have learned much that I hope to pass on once I get a website up and running. How would you describe the poetry community in Canada, and their response to the fire through this anthology? Disappointed at first as I had approached two potential different partners to help with project, but they failed to commit. So, I decided to go it alone and sent out submission guidelines through 21 individuals, blogs, and poetry/writing sites across Canada. It was summertime and I only had 20 entries by the end of August. Deadline was in early September so I sent it out with a greater sense of urgency and extended the deadline by request from some poets. Finally, the poems came flooding in and we had more than enough for the anthology. Was pleased and proud poets responded so strongly eventually. What is unique was collecting specific poems related to the fire and its aftermath. All projects bring out the highs and lows but somehow success has shined through it all. Doubly proud of the diverse poetry community in Canada has shown solidarity with the residents of Fort McMurray. For people who have a difficult time “getting” poetry, how is hearing poems read aloud by their creators a good bridge to inspire understanding and connection? Poetry is about storytelling with an elegant twist. Hearing the poet perform connects you more emotionally and deepens your understanding of what the poet has been inspired to write about. Our voice adds a stronger dimension of authenticity connecting one heart to another and as someone said shortening the distance. What is your personal story related to the fire? Had several friends who had to be evacuated from the work camps when the fire spread. I was just planning to come out for a 6-month project that got cancelled. I followed it in the media and began to write a poem about the heroism and generosity of Canadians. Then felt I needed to do more and began the anthology project as a way of helping the ongoing healing process in the community. Wanted poets across the country to show they cared along with myself. They have written of their losses and tragedies and how they have overcome them. Along with a section on poems about the fire. Where can people purchase copies of this anthology and support the project? 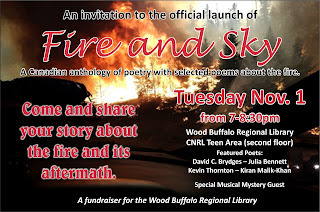 The first official book launch for Fire and Sky will be held at the Wood Buffalo Regional Library on Nov. 1 Tuesday evening CNRL teen area second floor from 7-8:30pm. They are $15 and please bring cash or a cheque. A limited number of books will be available. All books sales will be donated to the Wood Buffalo Regional Library. We encourage anyone who wants to tell their story about the fire to come out as part of the event will be devoted to telling your story.